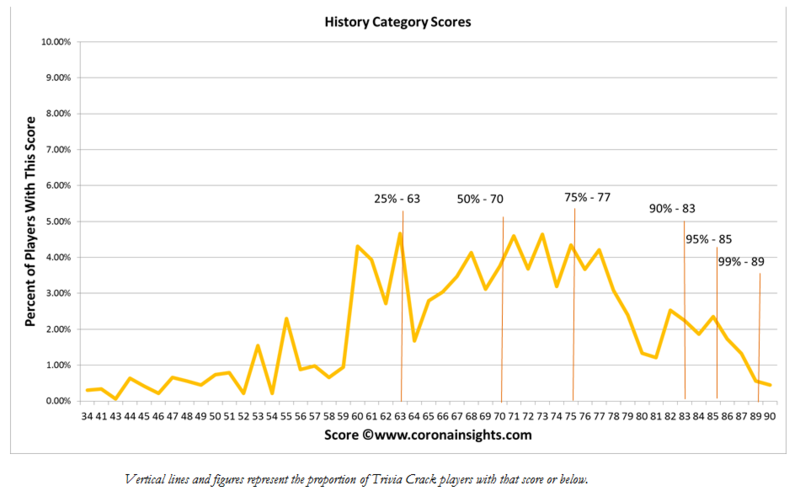 History is our fifth Trivia Crack category to analyze, and the sixth blog in our series. Let’s take a look at scoring patterns in this tough category. History is clearly a challenging category. It only takes a score of 63 to beat 25 percent of scores, and a score of 70 will put you in the top half of Entertainment contestants, which is lower than the figures that we’ve seen in other categories so far. But you need a 83 to break the 90th percentile, which is higher than most of the other categories we’ve seen so, and it takes an 89 to land in the top 1 percent. So more people have low scores in history compared to most other categories, but more people also have high scores. This category therefore sees a broader spread of scores than most categories. So how does History compare to other categories? On average, it’s a distant 5th. 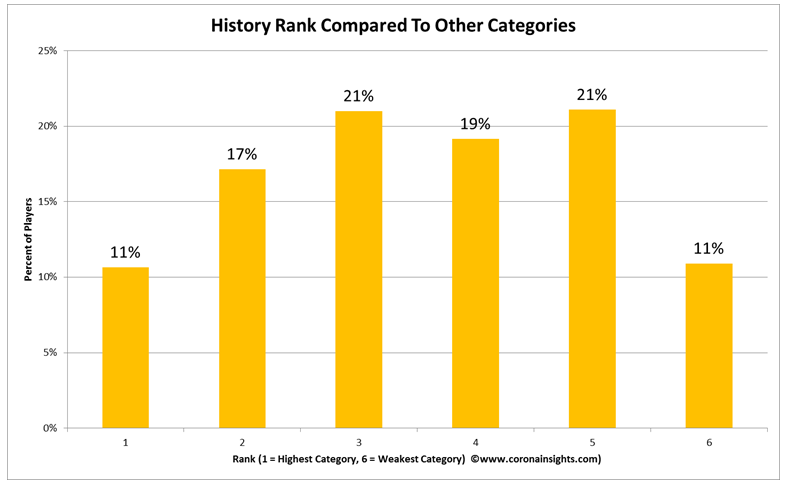 History is seldom a player’s weakest category, but also seldom the strongest category, and is more likely to rank in their bottom three than their top three. If you’re good at History, does that predict that you’re a good overall player? And if you’re weak at History, are there other categories where you’re strong or weak? We did a correlation to test that analysis. We won’t reveal our analysis of total scores until later – you know, to build up suspense – but we can look at correlations. First off, we should note that there’s a strong correlation between every category and total score. We would expect that, because your total score is just the sum of all of your individual category scores. 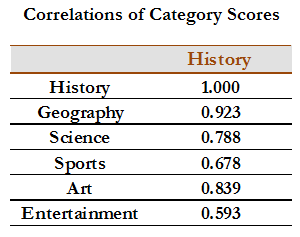 However, there’s a stronger correlation in some categories than others, and History is a very strong predictor of overall score. It has a Correlation factor of 0.928, where 0 means no relationship at all and 1 means that it’s a perfect predictor. This is the second-strongest correlation among the six categories, almost as strong as Geography. Your History score is therefore a very good indicator of your total score. And what category most closely aligns with History? Another simple correlation analysis shows that the scores that run most closely in parallel to History scoring is Geography scoring. As we noted in our earlier Geography blog, you apparently learn a lot of geography when you learn history, or perhaps vice versa. Arts also has a high correlation, and as we’ve seen with other categories, Entertainment is typically a different skill set. If you’d like to know exactly where you stand on History, here’s a chart that estimates the proportion of players who score at or above a particular score, based on our modeling. Art is up next, and it is our final individual Trivia Crack category to analyze.